FILE - A demonstrator waves the French flag onto a burning barricade on the Champs-Elysees avenue during a demonstration against the rising of the fuel taxes, Nov. 24, 2018 in Paris. French President Emmanuel Macron, caught off guard by violent demonstrations against diesel tax hikes, warned his cabinet on Monday that the protests could tarnish France's image and said the government needed to listen to voter anger. FILE - Protesters wearing yellow vests, a symbol of a French drivers' protest against higher fuel prices, clash with riot police on the Champs-Elysee in Paris, Nov. 24, 2018. 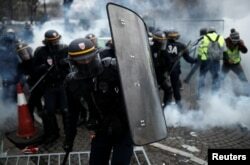 Police on Saturday fired tear gas, water cannon and rubber bullets at thousands of protesters who trashed restaurants and shop-fronts and set wheelie bins ablaze on Paris' upmarket Champs-Elysees boulevard, a tourist magnet. "We shouldn't underestimate the impact of these images of the Champs-Elysees [...] with battle scenes that were broadcast by the media in France and abroad," government spokesman Benjamin Griveaux said. 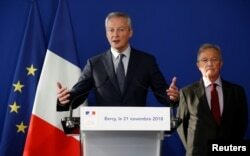 After meeting with business associations, Finance Minister Bruno Le Maire said the protests would have a "severe impact" on the economy, though it was too soon to say what the effect on fourth-quarter growth would be. Now in their second week, the "yellow vest" protests have blocked roads across the country, impeding access to fuel depots, out-of-town shopping malls and factories. "Behind this anger there is obviously something deeper that we must respond to, because this anger, these anxieties have existed for a long time," Griveaux said. 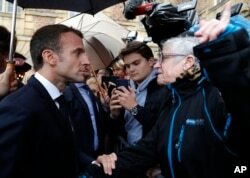 FILE - French President Emmanuel Macron argues with a resident as he arrives for a meeting at the city hall in Charleville-Mezieres, eastern France, Nov. 7, 2018. The weekend's violence also exposed tensions within the amorphous "yellow vests" movement, so-called because the protesters don the high-vis jackets which all motorists in France must carry in their vehicles.